A Smart Grid is a digital energy management system that controls the generation, storage and distribution of electricity within a connected system. It incorporates a bi-directional information and energy grid with digital connections to all of its components in order to be in a position to balance electrical supply and demand over the range of its control. The principles of balancing local electricity supply and demand can be extended where electrical storage is also available to save surplus electricity generated at night or by intermitted generation, to times when demand is greatest, often in the early evening. Electricity can be stored in batteries, including batteries in the increasing number of electric vehicles. 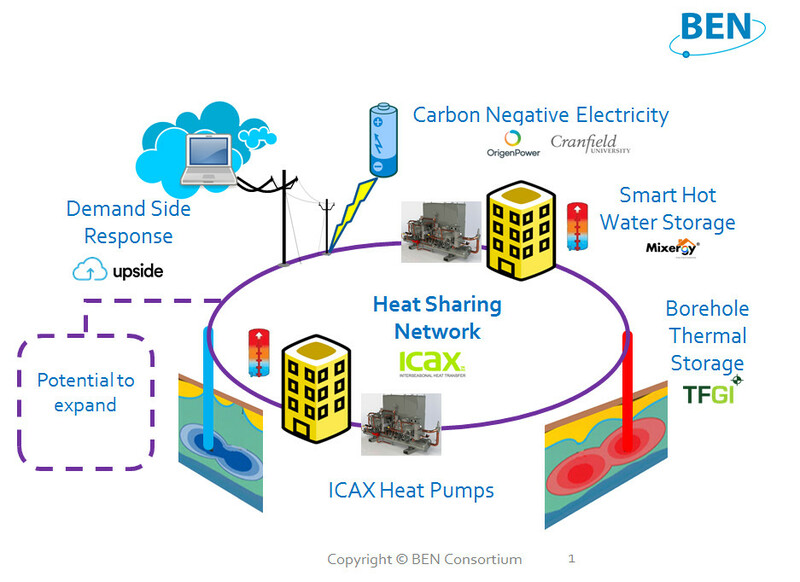 The principles can be further extended from electric supply, storage and demand to heat supply, storage and demand. This is made possible by the electrification of heat using heat pumps to transfer, and concentrate, heat from one place to another. Heat can be stored overnight in insulated hot water cylinders, and in the thermal mass of buildings. The ground can be used as a very effective long term store of heat between summer and winter. Before smart grids came into play the UK National Grid used to be largely a one-way system with power generated in large power stations and distributed radially through transmission and distribution lines, with very little storage capacity. The grid had to plan to bring in reserve capacity to meet peak demand and cope with intermittant supply from wind farms and solar generation. It was also limited in digital communication and controls. Large scale integration of renewable distributed generation into the power grid has significant potential not only to reduce carbon dioxide emissions, but also to provide secure and resilient power. The increasing number of variables in both supply and demand has added complexity to the system and led to the adoption of digital control of the systems including intelligent two way communication across the internet between suppliers and users of electricity, not only on the national level, but also at the local level: the birth of Smart Grids.